What’s the Difference Between Water Softeners & Water Conditioners? As a new homeowner, you’ll likely face a common question: do I need a water softener? After some research, you’ll likely come across some info about a similar piece of equipment called a water conditioner. The differences between the two can be confusing, but making the right choice can have a significant impact on you and your family’s health and your home’s appearance and value. Many areas across the country – especially Southern California – have “hard water,” which means your tap water has exceptionally high mineral content. Hard water is not particularly unhealthy, but it’s capable of causing some costly problems for your home. The most costly issues include scaling, pipe blockage and even pipe leaks. Scaling is the buildup of minerals to form a deposit called lime scale. Hard water mixed with soap forms nasty soap scum, which leaves a bathtub ring on your surfaces. 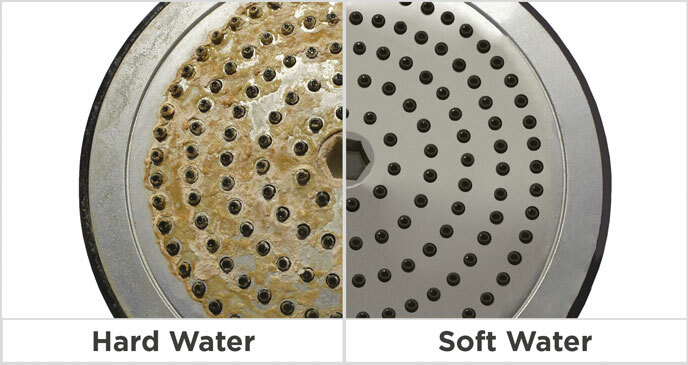 The difference in scaling between a showerhead with hard water and soft water is obvious. Excessive scaling can lead to clogged pipes, which decrease water flow rate to your faucets and showerheads and can even affect the life of toilet flushing units. 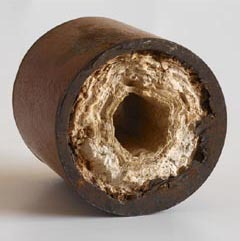 A pipe clogged with hardness minerals. Eventually, the scaling in your pipes will allow less water to flow through. Showerheads will dribble instead of spraying and faucets will deliver a weak stream of water. Buildup in your faucets can also lead to faulty shutoff mechanisms and dripping faucets. The third costly effect of hard water is when dissolved minerals eat through pipes causing leaks and water damage in your home. It’s important to realize this potential issue early, because there are water pipes throughout your home and even a small hole can result in VERY costly damage. Pipe with a significant leak due to hard water. The effects of hard water are not limited to your home and plumbing fixtures; it can also affect your quality of life. Hard water requires more soap or detergent and water for showering and laundry. åAdditionally, mixing soap and hard water on the body can cause what’s referred to as a “curd,” which can remain on the skin after rinsing, clogging pores. 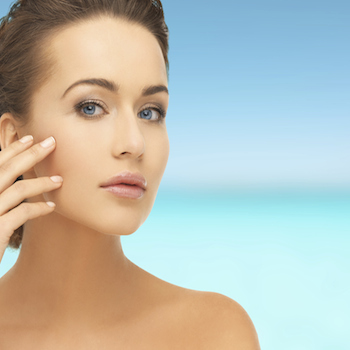 This serves as a breeding ground for bacteria, rashes and dry skin irritations. 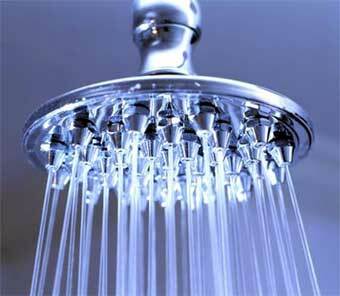 Hard water also leads to mineral deposits in your hair, making it harder to untangle post-shower. Now that you understand the multitude of issues surrounding hard water, let’s discuss the best way to get rid of hard water in your home. A water softener may be the more popular option, but I’m going to explain to you why a water conditioner is the better option for your home, your health and your wallet. 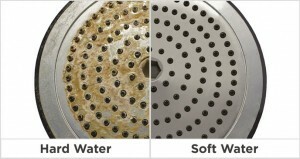 The biggest difference between water softeners and water conditioners is water quality. The reason is pretty simple: water softeners DO NOT filter your water and water conditioners do. Water softeners use what’s called “ion exchange,” which swaps hardness mineral ions for sodium, reducing the water’s hardness. The problem is that softeners only focus on hardness, not contaminants such as chlorine and carcinogenic disinfectant byproducts like chloroform. 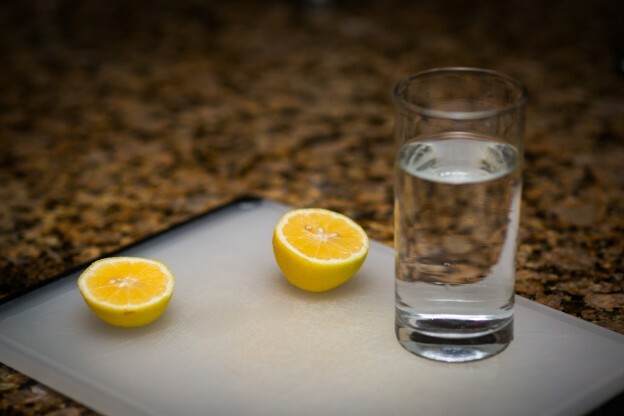 Chlorine is generally the most noticeable contaminant in tap water (due to the large amount added in at a municipal level in order to disinfect water). It is also quite dangerous and damaging to your health and beauty. 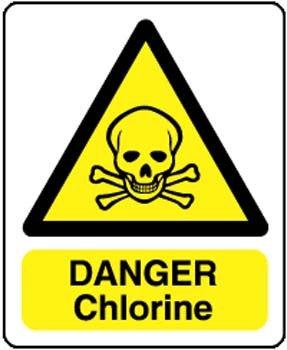 Chlorine can cause cancer over time when ingested and is notorious for drying out skin and hair. 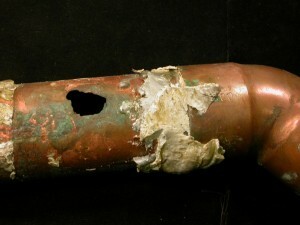 In addition to being dangerous to the body, chlorine can contribute to pinhole leaks in your pipes. Without a conditioner, you will not be able to remove chlorine and other dangerous contaminants – you will simply have softer, dirty water. As I mentioned above, water softeners use a process called “ion exchange,” which is about as complicated as it sounds. It requires electricity (which drives up cost of operation) and maintenance such as buying, hauling and adding salt periodically. In addition to being physically trying and time-consuming, adding salt also requires upwards of $200 per year. Ion exchange is also not eco-friendly in any way. The process requires waste water to be expelled through a special drain. 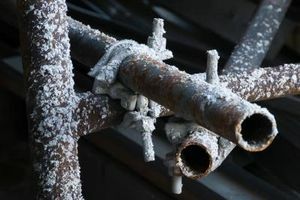 Research showed that this briny waste water was actually affecting area water supplies, leading to the recent ban of salt-based water softeners in cities such as San Diego and Los Angeles. That’s right: if you live in Southern California, you are likely outlawed from even purchasing a salt-based water softener. Water conditioners do not use any electricity, saving your energy bill. They also create zero wastewater and require no maintenance aside from annual filter changes. Additionally, water conditioners use significantly less floor space in your garage and make no noise. On an aesthetic level, conditioners produce water that mixes well with soaps and detergents, allowing you to use less of each, saving you even more money. Conditioned water also feels better in the shower, whereas softened water leaves a distinct “slippery” feel on the skin. Of course, one of the most important aspects of any home improvement purchase is the price. What is it worth for you to have clean water and fortified investments in your kitchen and bathroom fixtures? Obviously, many companies will use this argument to justify ridiculously-priced items. But water conditioners are actually priced significantly below water softeners. The Evolution Whole Home Water Conditioner starts at only $795, compared with softeners in the thousands of dollars, plus maintenance costs. Conditioners also save you from the electricity and water costs associated with a complicated softener. Most importantly, though, a Water Conditioner preserves the health of you and your family, as you can be sure the dangerous contaminants found increasingly in tap water supplies will be eradicated at the source. Call 619-356-3766 or email info@evolutionhealthworks.com today for more info about how a Water Conditioner can help improve your life and the value of your home! This entry was posted in Children, Contaminants, Drinking Water, Ground water, Home Water Filtration Systems, San Diego, Shower, Tap Water, Water Filter, Water for beauty, water for health, Water Treatment, Whole Home Water Filtration System, Whole House System and tagged chlorine, hard water, hard water buildup, protect fixtures, scale free fixtures, scaling, soft water, water conditioner, water softener on June 8, 2015 by Adam. Chemicals in Bottled Water: Where Do They Come From And What Are The Effects? The more we learn about bottled water, the more it has become clear that is is not a safe alternative to tap water, as many of the companies lead us to believe. One of the biggest issues with bottled water is the amount of chemicals it contains. How do chemicals get into bottled water? Chemicals get into bottled water in two different ways. 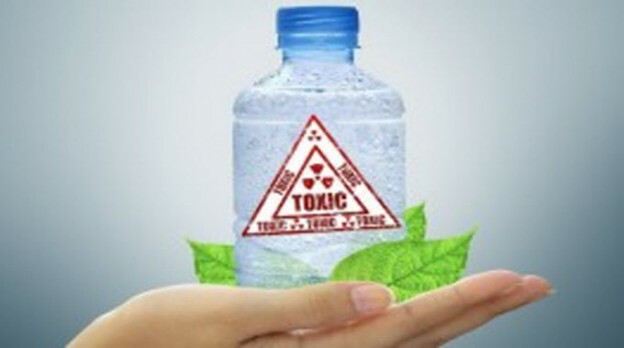 First, certain chemicals (like chlorine and chloramine) are present in the water that gets bottled in the first place. Many bottled waters are simply bottled tap water, so many of the common chemicals that you see in tap water are also present in bottled water. The second way that chemicals get into bottled water is from the plastic that the bottles are made of. Plastic contains many different types of chemicals – such as BPA – that can leach off of the bottles and get into the water they contain. How many chemicals are there in bottled water? According to a recent study, a single bottle of water contains nearly 25,000 different chemicals. Many of these chemicals mimic the effects of pharmaceuticals in our bodies, and they can interfere with our hormone receptors. 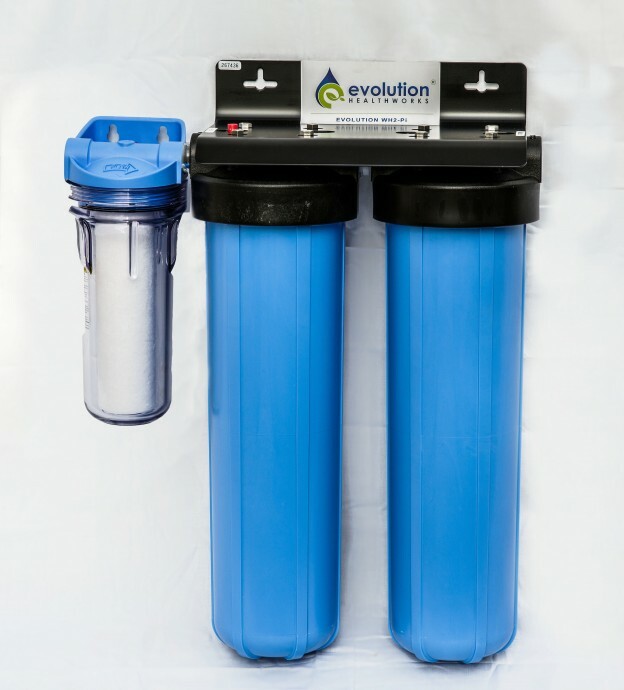 Why is a Evolution Healthworks home filtration system a better alternative to bottled water? Our Water Filtration System provides you with the certified healthiest water, far superior to bottled water, and you dont have to worry about any of the other possible ways bottled water can contaminate you. We offer Water Filters that can provide you with the purest and healthiest drinking water. This entry was posted in Bottled Water, Contaminants, Water Filter, Water Ionizer and tagged bottled water, BPA, chemicals, children, chlorine, pharmaceuticals, plastic, pregnant, premature birth, tap water on July 23, 2014 by Drink H2O.